How big are your bowls?? Depends what size taco you use really. Make your own crisp serving ware. Then load it up to make your own Taco Bowl. Sauté the onion and mince in a pan. Once brown add in KNORR Mexican Chunky Salsa Mild GF and cheese. Allow to simmer until meat is cooked and cheese is melted. 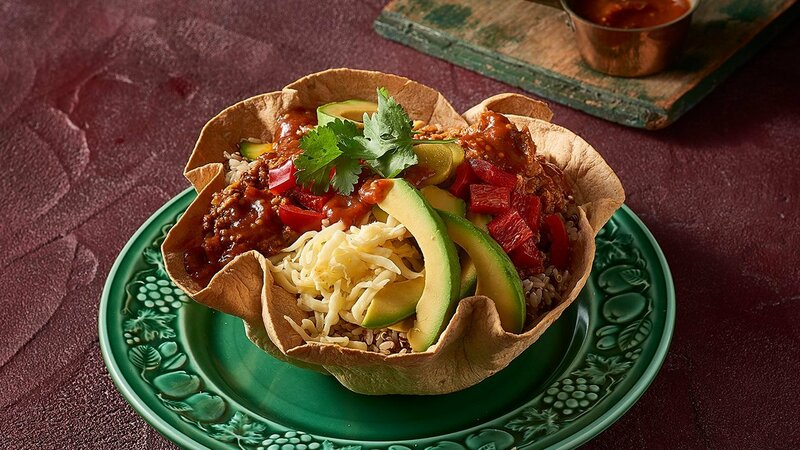 To make the bowl - take two sizes of stainless-steel bowls and place the soft taco between the bowls. Place in oven and bake at 180 degrees for 8 minutes - remove the top bowl and cook for a further 4 minutes. Remove from oven take out of the stainless bowl and turn the stainless bowl upside down. Place taco bowl over the stainless bowl and continue to bake for another 6 minutes or until golden and crisp. Fill with rice and quinoa mix and then arrange the remaining ingredients.